The historic city of Trinidad, Colorado, lies nearly halfway between Denver and Santa Fe, New Mexico. Travelers of every stripe drive the asphalt artery that connects these two thriving metropolises, Interstate 25. This north-south thoroughfare allows commerce to thrive, especially since the speed limit is often 75 mph along the route. But commuters and travelers seeking the attractions that Denver and Santa Fe provide would be well served to slow down, to spend at least one day and night in the fascinating city of Trinidad and to play a round or two or three of golf along this stretch of the I-25 corridor. Whether heading north or south, travelers should be sure to plan their itineraries such that they stay at the La Quinta Inn & Suites Wellness Hotel in Trinidad. Simply put, this first-rate facility is the highest rated hotel of the nearly 900 properties within the La Quinta chain. Considering that Trinidad is a town of fewer than 9,000 people, this top rating is astounding, and it results largely from the operations manager, Cy Michaels, having assembled a professional, accommodating staff that ensures a pleasant stay for all of the hotel's guests. Trinidad Municipal Golf Course (trinidadgolfcourse.com) is about a two-minute drive from the La Quinta. This beautifully manicured course is perfect for business travelers who want to sneak in a quick 9 holes before getting on with their professional pursuits. The people who run the course and many of the golfers in Trinidad consider this extremely challenging 9-holer to be the best 9-holer in the state. Any golfer who lines up a putt on this course's greens, strokes the ball solidly, then watches the ball roll true to the hole will find it difficult to argue the point. Although some people will find the second hole, with its blind tee shot over trees, a bit much, nearly every golfer will come away feeling that Trinidad Municipal Golf Course is an affordable, hidden gem, which literally overlooks I-25. Since the pace of play on Trinidad's course is generally quite quick, golfers who play either 9 or 18 will still have time to take in the non-golf-related attractions that Trinidad possesses. Anglers who want to fish in Trinidad Lake, located less than two miles from the La Quinta, can simply pick up a license at the Walmart that sits between the La Quinta and the lake, then test their luck in pursuit of more than half-a-dozen species. Trinidad Lake State Park also offers ample hiking opportunities, and if perambulators prefer their walks to take place on paved surfaces, they can stroll Trinidad's downtown, which features one architecturally significant building after another. While downtown, diners with discerning palates and who also appreciate vocal accompaniment with their excellent meals should indulge their appetites at Rino's Restaurant. And no traveler should visit Trinidad without taking in the artistic and cultural wonders housed in the fascinating A.R. Mitchell Memorial Museum of Western Art (armitchell.us). Fans of painting, the West, history and the creative realms in general will find the $5 admission price to be more than a bargain. 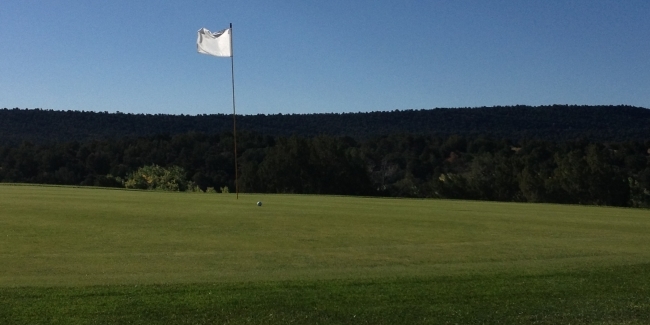 A little more than 20 miles south of Trinidad sits the city of Raton, New Mexico, and golfers who want to play a course that is the yang to Trinidad's yin should tee it up at rustic Raton Country Club (ratongolf.com). Although not as well maintained as Trinidad's course, the Raton 9-holer delivers an exceptional layout that mixes short and long par 4s and features enough elevation changes and uneven lies to keep even scratch golfers interested. Deer and wild turkeys are abundant, and black bears are so prevalent in the area that golfers should generally be alert and should always watch their steps. About 45 minutes north of Trinidad in Colorado's Lathrop State Park, Walsenburg Golf Course (parks.state.co.us/parks/lathrop/Pages/LathropStatePark.aspx) delivers quite possibly the best bargain in golf. The course features very small, mostly elevated greens, so although the "slope" seems anemic and the course may not appear by the scorecard to be worth playing, the Monday-through-Friday, $10 rate to walk 9 holes (or $15 for 18), when combined with the astounding views of the surrounding mountains, makes this course well worth a round or two. It is also the only course of the three mentioned so far that has a dedicated driving range. Farther north, only 20 minutes south of Pueblo, golfers can test their games on an 18-hole course located in Colorado City called Hollydot Golf Club (hollydotgolf.com). From the gold tips, this course plays 6,854 yards and features a slope of 130. This course, too, is extremely affordable, so golfers with a hankering to play a quick 18 without breaking the bank should consider Hollydot. From Pueblo to the north to Raton to the south, the course along I-25 - or not very far off of it - that every golfer should experience is the 18-hole championship course Grandote Peaks Golf Club (grandotepeaks.com) in La Veta, Colorado. Though only a short drive from Walsenburg Country Club, Grandote Peaks is titanium to Walsenburg's persimmon. A Weiskopf/Morrish design that affords golfers ample views of the spectacular Spanish Peaks and the Sangre de Cristo Mountain Range, Grandote delivers links-style, grip-it-and-rip-it golf so ingeniously and in such an amazing setting that golfers who are used to playing over-priced and over-rated courses may be shocked that such a stellar course is located in the tiny town of La Veta and will cost traveling golfers a mere $55 to play, including cart, on weekdays. From the tips, this challenging course plays 7,085 yards and features a slope of 136. The knee-knocker of a tee shot on the first hole may be enough to send first-time players of Grandote to the blue tees, and there is no shame in that, particularly since that 136 slope from the blacks seems low. The fact that this course is only a little more than an hour away from Trinidad may convince golfers who play it to book another night at the La Quinta, then head north again for another round. Or, of course, they could simply squeeze in 36.
photos and paintings can be found at freelanced.com/bruceleonard.